This week I’d like to introduce you to an easy-peasy and absolutely charming little stitch pattern called the close scallops stitch. These scallops (which can also be known as a fans) are created by repeating a sequence of stitches like this: skip 2 sts, work 4 dc in one stitch, skip 2 sts and work 1 sc in a stitch space. The sc stitch works as an anchor to keep the scallop stitch in place and eliminates the gaps between the sets of scallops. 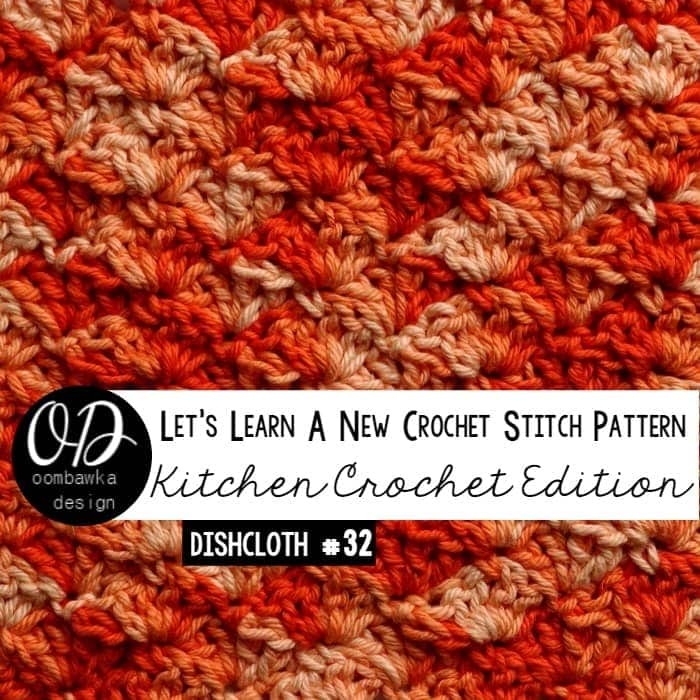 The finished fabric is pretty and softly textured making it the perfect stitch to use when crocheting afghans, baby blankets and other baby items. As a quick aside, this is the first time I have ever tried Creme de la Creme yarn and I really love how it works up – not to mention the colorway I used beautifully transitioned through different shades of orange – the overall effect is really pretty and I’m afraid my photos might not do it justice! 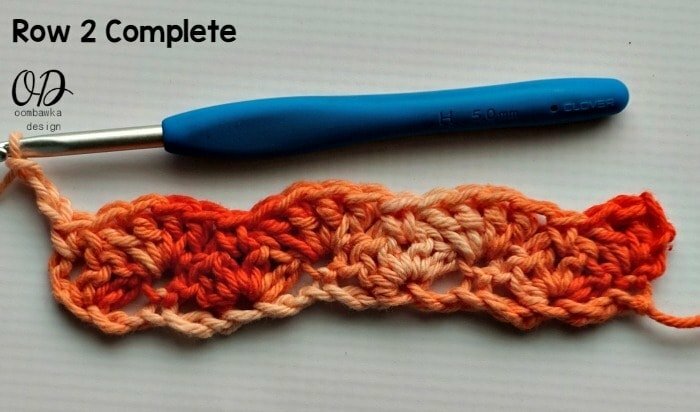 60+ Crochet Stitch Tutorials You Need to Save for Later! EASY (a dedicated beginner will have no trouble with this). My Sample worked out to be exactly 7-inches square with one round of sc edging. For a 7 inch square you need to start with 31 chs and work a total of 16 rows and a 5 mm (H) hook. You will find sizes 9 inches and 12 inches at the end of the post. Rep R2: 10 times, for a total of 12 rows. Do not finish off. Ch 1 and proceed to the edging. The dishcloth measures approximately 5 inches x 5 inches. Sc evenly around the outer edge of the dishcloth. You will have approximately 18 sts on each side and 1 extra in each corner when you are finished the first round. When I did this I worked 2 sc in the side of each ch 3 and 1 sc in the side of each sc; along both side edges. 3 in each corner and for the top row 1 sc in each dc, 1 hdc in each sc and 3 in the final corner. 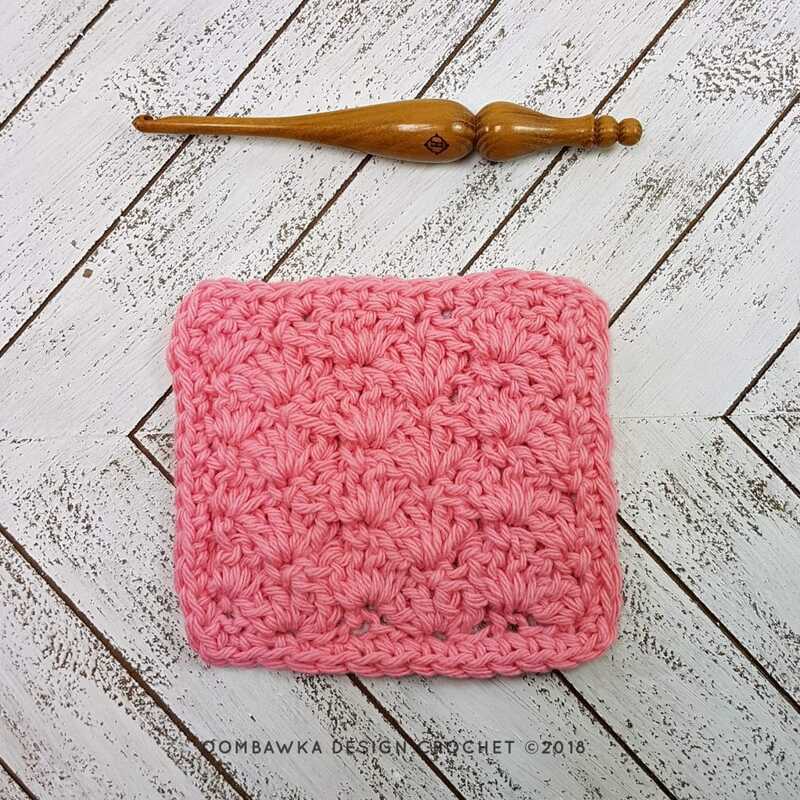 You will need to complete 1 additional round of sc (working 3 in each corner stitch) to reach the 6 inch square size when using a 5 mm hook. Finish off with an invisible join and weave in ends. Rep R2: 20 times, for a total of 22 rows. Do not finish off. Ch 1 and proceed to the edging. 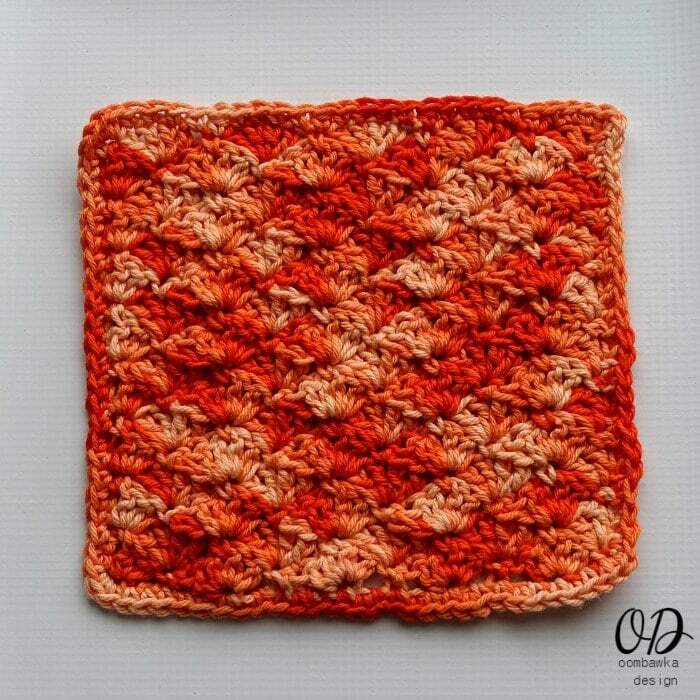 The dishcloth measures approximately 8.5 inches x 8.5 inches. Sc evenly around the outer edge of the dishcloth. You will have approximately 30 sts on each side and 1 extra in each corner when you are finished the first round. When I did this I worked 2 sc in the side of each ch 3 and 1 sc in the side of each sc; along both side edges. 3 in each corner and for the top row 1 sc in each dc, 1 hdc in each sc and 3 in the final corner. Finish off with an invisible join and weave in ends. Rep R2: 26 times, for a total of 28 rows. Do not finish off. Ch 1 and proceed to the edging. The dishcloth measures approximately 11.5 inches x 11.5 inches. Sc evenly around the outer edge of the dishcloth. You will have approximately 40 sts on each side and 1 extra in each corner when you are finished the first round. When I did this I worked 2 sc in the side of each ch 3 and 1 sc in the side of each sc; along both side edges. 3 in each corner and for the top row 1 sc in each dc, 1 hdc in each sc and 3 in the final corner. Finish off with an invisible join and weave in ends. Thank you so much for such a thorough tutorial. I really like the image where you used different color yarns to explain the pattern. Thank you for such a quick pattern for beginners! 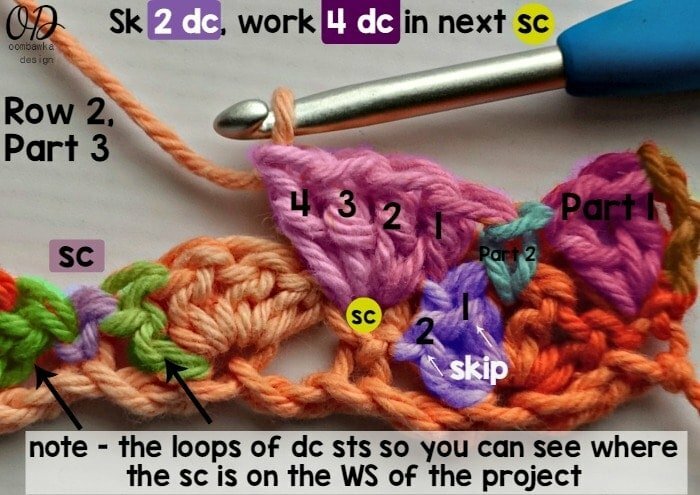 I normally just do single crochet and this pattern is a wow factor to my dreams! 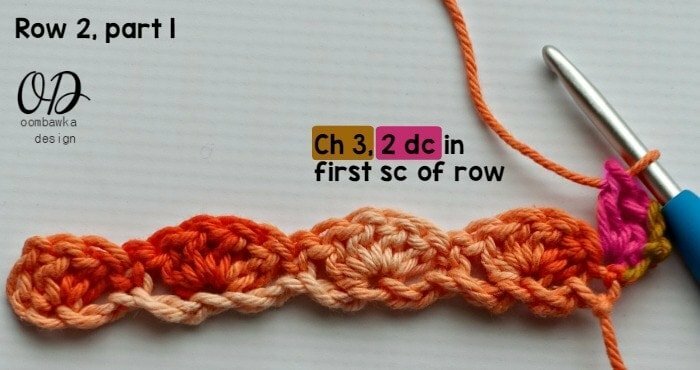 how to follow a pattern if they are new to crochet. It’s the photos & the numbering of the stitches that is extraordinary! The ladies I’m teaching to crochet will love this. We’ll be checking your website for other patterns. Thank you for all the work and time it took to complete these instructions. ? Would you consider making a Youtube video for visual learner’s?